Biggest 7s tournament on the West Coast...This Weekend! If you've been around rugby in California for awhile you've heard of the Tri Tip 7s and if you haven't you need to be playing more rugby. Even if you don't play 7s you've heard of this tournament. This is the 30th Annual Tri Tip 7s and for us in California its the final run of 7s before clubs transition back into 15s. 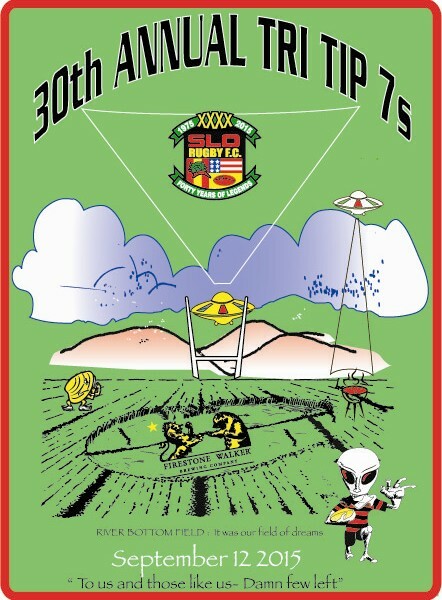 This annual even is held in San Luis Obispo (SLO) by SLO Rugby Club each September after Labor Day and features great weather (other than the year that there was a wild fire next to the park), some great pitches (they can get 4 going) and great rugby. Reg Greenwood the event's organizer says "Its a way to celebrate the end of summer and 7s". Each year the number of teams competing grows, from clubs looking to play serious 7s to sides that are social (like a side of all props or old boys). Event organizer Reg told us that they have teams from Texas, the south and the east coast now seeking to play in the tournament. Reg said "part of the appeal is we are at the rugby crossroads where teams from SoCal and NorCal can play each other, we are located centrally. Also our tournament is a throw back to the old tournaments. We don't break it down to college, old boys, etc, we just have men's and women's and let the competition and play determine the best team of the day". The best part about this tournament on the Central Coast is that teams come from all over the State to play. There are teams as far south as San Diego and all the way up north to Chico. This year's line up features over 35 teams for the men's competition and 12 women's sides making it the largest 7s tournament on the west coast! This event is SOLD OUT as far as entries (there are a number of teams on a waiting list). Reg says "for guys whose teams didn't get in, its a good chance to whore on, as a lot of team will be happy to pick up guys". Now some of these sides are just sides formed for the tournament, and others are serious national contenders in 7s and 15s. The Pismo Clowns who haven't played as a side in over 20 years will be running in this as an old boys group, so there is always something new. Last year's winners EPA Razorbacks training for this year's Tri Tip 7s. Last year the EPA Razorbacks won the tournament and are coming back this year to win it again. Golden Gate's women won the tourney last year and are also back to defend their title. As with all great tournaments there is not just the Cup to be won, but also the Plate and Bowl! Each team is set to get at least 4 games in. This tournament is well organized and the day goes fast. If you are playing great, if not you should still go out and spend a day there (it will be much cooler on the coast at least). There is a lot of great rugby being played, with high caliber players always mixed in. Each year there are clubs who are national champs, or contenders playing and there is always a mix of top collegiate players/All Americans in the line up, former Eagles, Eagles Pool players and coaches (like USA Eagles Coach Mike Tolkin) playing or taking in the action. Reg says what makes this tournament grow and so popular is the experience and memories players leave with. Its either the time the scored, or went up against and Eagles player or their side defeated a top level side, or had that big hit, etc. "We have fun, great food, beer, so it social, but there is also great rugby" and that is what Reg attributed to the continued growth of the Tournament. Not only is this a great day of rugby each year, but afterwards ruggers can hang out in downtown SLO which is a fun college town with plenty of watering holes. This event features a large beer garden and Reg and the boys have made over 250 lbs of sausage which will be served in the beer garden. They will have over 500 lbs of the famous Tri-Tip as well. The teams participating in this tournament will be treated to the world famous Santa Maria Tri Tip (which can be worth the trip). When you factor the cost of tri-tip per pound vs the cost of the tournament you'll see it not about the tri-tip, its about tradition and a love for the game. All the pools for the day and listing of clubs is on the SLO Rugby website www.slorugby.org. Best of luck to all the clubs and don't forget to get the T-shirt!!! Newer PostBack Bay back at it.